The Devon NGS booklet for 2019 is in circulation with 108 different venue listings (and some of these are group listings comprising of several different gardens), many with multiple opening dates. Whenever you stay at Sandays there is always an opportunity to visit a garden somewhere nearby! 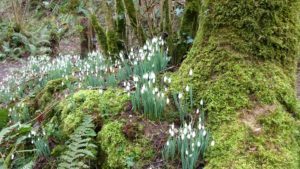 That includes February with various listings over the next few weeks, the main attraction this month being the snowdrops. However, mini daffodils, some early primroses and crocuses and the first camellias are also featuring quite strongly around here. Thanks to the generosity of garden owners, volunteers and visitors, the National Garden Scheme has donated £55 million to charity since 1927. Originally set up to support district nurses, the National Garden Scheme is now the largest single funder of nursing and caring charities in the UK. They also support charities working in gardens and health, grant bursaries to help community gardening projects and support gardeners at the start of their career. In 2018 a record £3.1 million was donated.